If you're looking for some springtime reading that will help you gain some perspective on the scale of marine resource exploitation, I recommend The Unnatural History of the Sea by Callum Roberts. This is a great nonfiction book that provides an in-depth account of marine resource exploitation dating back to the 11th century medieval Europe. 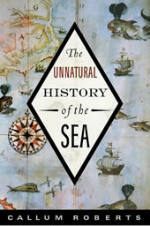 Using firsthand accounts from early mariners and a variety of other sources, Roberts creates a colorful illustration of human reliance on marine resources and inspires awe about the life our oceans once supported. Roberts also warns about the dangers of shifting ecological baselines--a phenomenon where each generation assumes the current conditions they personally experience are the norm rather than looking at historic landings, species diversity, and average body size of different species. The ocean has historically supported a greater diversity of species and in higher abundance than today. If we look at the ocean's current status only within the context of our lifetime, we easily lower our standards, and a "successfull" rebound of a species may be only a fraction of its historic abundance. You can see a great photo series of shifting baselines here. While it is a sobering subject, Roberts' writing is very engaging and his call to action is inspirational and necessary if we want to improve the state of marine resources. I do believe that we can achieve a balance between resource extraction and protection and hopefully maintain the commercial fishing industry as a viable livelihood that honors past generations of mariners. For his work, Roberts was awarded the 2008 Rachel Carson Environment Book Award from the Society of Environmental Journalists.